Our dedicated Minpinerie volunteer team received King Kong not long ago – he was sadly surrendered by his former owner to a shelter in Quebec. He is ready to find a new owner and would like to add his playful and loving ways to your life! He loves going outside and will run around until his little paws get too cold to stay out any longer. He is a nice, happy, little boy, however, he can be a bit bossy with the other dogs and maybe should be an only dog. King Kong’s house training is just about there. He handles well once he’s been introduced to someone and greets strangers in the house enthusiastically, however like many, many other dogs, he will take a while to warm up and approach a stranger. Would you like to meet him? 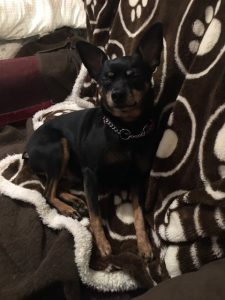 — Thank you for your interest in a Minpinerie Rescue Group dog. We are based in the Ottawa area. All dogs are fully vetted and fixed, and we assess behaviour to the fullest extent possible so that our adoptions will be as successful as possible. You must fill out the application and be approved to adopt. 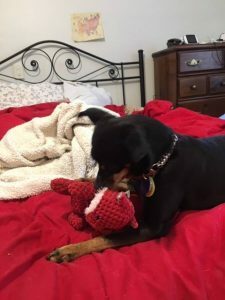 If the specific dog in this post doesn’t sound suitable, please understand we have dogs arriving all the time, and MOST go quickly to pre-approved adopters that suit them (that is, many dogs are never posted to our website! Only when we have an overflow!). So, please fill out the application at this link to get in the pool, BUT NOTE SOME FOLKS ARE HAVING TECHNICAL DIFFICULTIES, SO IF THAT’S YOU, PLEASE SEE INSTRUCTIONS AT THE SAME LINK! Thank you and talk soon! 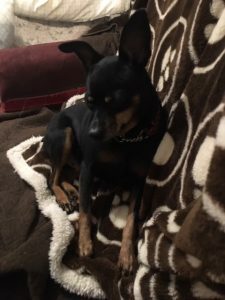 Marty – looking for love and ready to give you lots!